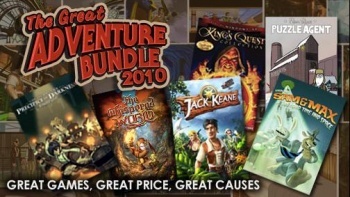 Not only is Telltale's Great Adventure Bundle 2010 a good deal, a portion of the proceeds go to a charity of your choice. It's time to break out your wallets, adventure game fans. Telltale games is now offering the Great Adventure Bundle 2010, which could contain six games for just $20, with 25% of the proceeds going to charity. The "could" part comes in because two may only be unlocked if Telltale sells enough bundles. The bundle definitely will include Daedalic's The Whispered World, Deck 13's Jack Keane, Activision's King's Quest Collection, and Hothead's Penny Arcade Adventures: On the Rain Slick Precipice of Darkness, Episode 1. If you count every King's Quest game in the collection, that's like getting ten games. If Telltale sells 5,000 bundles, purchasers will see the unlock of Puzzle Agent, Telltale's Professor Layton-esque puzzle adventure. At an unknown number of bundles past that, Telltale will unlock Sam & Max: Season Two, a collection of five Sam & Max episodes. All six games included hold a retail value of over $100 when sold individually. Telltale is allowing those buying the bundle to choose one of five charities that they want their money to go to. Choices include Child's Play, the Electronic Frontier Foundation, the Leukemia and Lymphoma Society, Nyota e.V, and the World Wildlife Fund. Support game developers and charities, get yourself some games. I don't see any losers in that equation. As of this writing Telltale has sold 772 bundles, with the sale set to expire on September 10, 2010. So get to buying! UPDATE: Telltale has announced that Puzzle Agent will be included in all bundles. Sam & Max: Season Two will now unlock once 5,000 units are sold. Thanks, Wandrecanada.